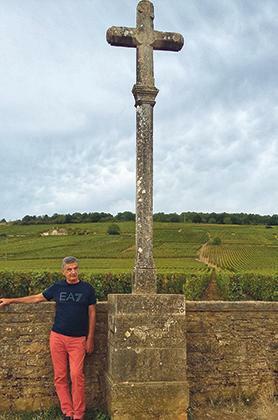 Robert Cachia spends four days in breathtakingly beautiful Burgundy. This is a snapshot of his diary. Squat, elegant and majestic... The Chateau de Vougeot. September 20: This afternoon’s two-hour drive north on the A6 Autoroute du Soleil from Lyon airport was quite unremarkable – corn and wheat fields everywhere – until we passed Chalon-sur-Saône. However, as soon as we entered the so-called Côte d’Or (literally, golden coast, a typically French euphemism for the liquid gold that abounds here… wine), the landscape changed dramatically. Around the village of Ladoix-Serrigny we found ourselves immersed in a vast ocean of vines on all sides. Not without some foresight we had booked our lodgings right out of Ladoix in a tiny hameaux (hamlet) called Buisson that stands astride the famous Route des Grands Crus, literally the route of the grand growths, another euphemism for the greatest wines of Burgundy. As you can imagine, this is a strategic position for someone like myself, who wants to taste and drink all this bien de Dieu in just three full days. Our host Isabelle, a sweet little woman of 50-something, had been expecting us behind the garden gate of her little cottage as we docked our car into the drive-in. Bonjour, bonjour Isabelle. Je suis Robert et ma femme Anna et ceux-ci sont mes amis Alex et sa femme Jacqueline – Hallo Hallo! 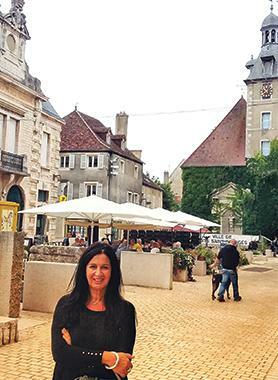 September 21: Yesterday evening we decided that we would have a quick look at Beaune, 15 minutes south of Ladoix, the true beating heart of Burgundy’s wine country. Desperately needing to assuage our hunger pains after yesterday’s haul from Lyon, we were eager to see this little town in its evening garb. And what a truly charming town it is. Parking at the very core of the centre ville (historic centre) was not much of a hassle either as this was still a Thursday. And dining in one of its brassseries (le Carnot) right on the pedestrian area was a delight. The décor at Carnot’s is typically French: brass fixtures, oak paneling and mirrors. As for the entrées, we opted for Esgargots (snails) and Oeufs Meurettes (poached eggs in red wine) to start with. No arguments about that, this is Burgundian fare. Then the plat par excellence of this area, Boeuf Bourguignon. As for the wine, we tried a Hautes-Côtes de Beaune, a pinot noir that is harvested on the higher slopes of the escarpment above town. All in all, this was a very satisfying first dinner in the prettiest part of town. The author at the Clos de Romanée-Conti. Since we are right in the very middle of the Route des Grands Crus, it is quite natural for us this morning to drive headlong for 15 minutes into the northern branch of this route, The Côte de Nuits, aptly called after another pretty town, Nuits-Saint-Georges. Place de la Republique, dominated by its fine ivy-covered belfry, or beffroi, is a jewel of a square and has numerous charming bistrots and cafes lining its sides. So we opt to book this evening’s dinner at a quaint yet stylish little place called La Cabotte. After an hour in Nuits we drive northwards for another 15 minutes and enter what is called the very holy of holies of Burgundian wine villages, Vosne-Romanée, home to its most celebrated and expensive Grand Cru, Romanée-Conti. The world-famous Clos de Romanée-Conti stretches gloriously and smoothly up the escarpment behind the village church and is marked by a stone cross that has come to symbolise this great wine for thousands of wine lovers from all over the world. 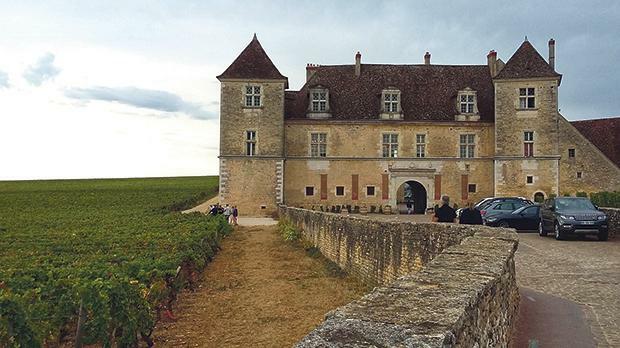 We aptly bump into three Japanese afficionados clicking away at the cross and then notice a vanette full of British tourists clumsily sipping some red wine and paying silent homage to this hallowed spot on their pre-booked Burgundy wine tour. A troupe of smiling middle-aged cyclists also breeze along in single file. This is evidently a meeting place for the touristes connoisseurs. The highlight of the Côte de Nuits is without any shadow of doubt the Chateau de Vougeot some 1.5 kilometres away from Vosne-Romanée. We drive through the field paths unhindered and happy to be immersed in this vast ocean of vines. As the chateau appears, squat, elegant and majestic, our hearts miss a beat. Such beauty in this world is rare to find, yet here we are in front of the most beautiful wine-producing chateau of Burgundy. It used to be, that is. Nowadays, the 85-odd vineyard owners of the Clos de Vougeot press their grapes and ferment their juice in modern-working farms on the edge of the village, but way back in the 12th century, around the year 1100, the monks of the abbey of Cîteaux on the other side of the valley established a domain here and constructed a working factory for the pressing of Pinot noir grapes that soon became the epicentre of a vast wine-producing mania all along the Côte d’Or. The monks went on to construct what must be the four largest timber wine presses in the whole of France. And they still sit there in the vast vat halls of the chateau, like fantastic da Vinci machines; huge and intricately ingenious in their sophisticated conception. We stand open-mouthed in front of them and feel small and completely overawed by such genial contraptions. My pal Xandru even takes a go at trying to turn the wooden screw that operated the huge beam lever mechanism but, single-handed, he soon gives up. Five hundred years ago, we are told, it would have taken four men to do the job. And so, after this lesson in medieval and renaissance ingenuity, we feel it is high time for some serious and informed wine tasting. At the Grand Cave de Vougeot in the village proper we sit down to sip and relish four great wines of the area. Now before going up to Burgundy I would have wagered a bet that we would have had no chance of ever coming close enough to sip on a Grand Cru. But here we are presented with a bottle of Gevrey-Chambertin Grand Cru, a wine that is said to have been the favourite of Napoleon Bonaparte himself! Now my idea of a great wine includes a full-bodiedness that one can immediately sense even at first glance. This Chambertin, however, is disappointingly light-bodied, but the taste is delicate and spicy enough to warrant such Bonapartian fame. Xandru and the girls agree completely. Our Grand Cave host also offers us a white bubbly Crémante de Bourgogne that tastes like the best champagne and a sublime Puligny-Montrachet that must be the best white wine I have ever tasted in my entire life. This evening’s dinner at la Cabotte in Nuits-Saint-Georges starts on a hilarious note as I struggle to get around to eating my entrée: a dozen escargots! The problem is that since my stroke six years ago, I have little control over my left arm. As a consequence, the caliper that I hold the snail shells with keeps slipping in all directions and this makes my wife’s task of prizing the mollusks from them for me so difficult and messy that at one point the garlic/parsley butter dressing starts streaming along her forearm under her evening top as far down as her elbow. So I decide I will have to eat these escargots my way. I ask Xandru to help out and grab the shells for me with his table napkin while I prize the elusive mollusks with the little fourchette in my right hand. Uff… so after a struggle the chore is done. September 22: The Saturday market in the old centre of Beaune is famous across all of Burgundy. So this morning we are off to see this celebrated weekly event in and around Place de la Halle. It turns out to be a charming exposition of the region’s agricultural and culinary delights: canteloupes, figs galore and cheeses of all shapes and sizes. It is a brilliant, sunny day and Place de la Halle is already teeming when we arrive. This morning, however, my main aim is to visit the Hospices de Beaune, a grand medieval edifice that used to serve as a hospital and rest home for the subjects of the Dukes of Burgundy. Its main hall, the Salle des Pauvres, aptly called the Hôtel-Dieu, was the main dormitory of the poor. Its cavernous timber ceiling looks like the inverted hull of a medieval ship. It is the central Cour d’Honneur, the great courtyard, however, that is the pride and joy of this historic edifice. With its sleek, pointed spire and brilliant ceramic roof tiles glittering in the morning sun it must be the most beautiful and moving spectacle in all Burgundy. The Côte de Beaune is a string of charming little villages spread out to the south of the town: Pommard, Volnay, Meursault, Saint-Aubin, each little community producing some of the most famous wines of this region. After doing all these villages, we end up at the very edge of this côte in a place called La Rochepot that has a magnificent chateau with towers sporting pointed roofs and a still functioning drawbridge in true Burgundian style. September 23: For our last full day in the Côte d’Or we must thank our car GPS for, after a long, 50-minute drive on the motorway we manage to home in on Vézelay, one of Burgundy’s most renowned pilgrimage towns, and after that, Noyers-sur-Serein, a sweet, little village by a river that could easily be a leftover from the time of the crusades, a Chaucerian village worthy of a Wife of Bath or a Nun’s Priest’s Tale. September 24: As usual, Isabelle has prepared a scrumptious breakfast for us this morning and we thank her heartily for her meticulous choice of jambons, fromages, moutardes, baguettes, jus d’orange, teas and coffees. We leave this lovely part of France with a sad and heavy heart, knowing that what we have seen in three full days was possibly only a little of the best that Burgundy has to offer. We might return one day, as the Côte d’Or is vast and certainly offers many more surprises hidden away in its hilly recesses.